When it comes to shopping during the holiday season, I go out once when the Christmas decorations are put out to see what is being offered for the year. If I find an outstanding ornament, decoration, piece of dinnerware, or yet another Christmas tree I think I need, I get it right away. For the others that are nice, I take notes. After the Christmas and immediate post-Christmas rush, I go out about a week after and if those items are still available, I purchase them usually at an extremely discounted price. This is how I’m able to decorate for the holidays without going broke! This last season, I was walking through K-mart and spied the cutest plates. I’m not one for melamine plates, but these sure fooled me! I thought they were porcelain. I liked the design so much I purchased all they had left, which was 7 of them. I knew they would create the most perfect table setting for a wintertime meal, so I designed an afternoon tea setting and a more formal dinner setting. 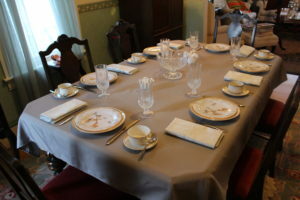 For the afternoon tea table setting, I used Excel’s Smithson tablecloth in grey (Herberger’s) and used Living Quarters’ Snowflake napkins (Herberger’s), as they pick up the snowflake design in the Deer plates. Those Deer plates, by Jaclyn Smith for K-mart, are on top on my antique Nippon plates I picked up at a thrift store. These were manufactured between 1912-1924, but take a look at the design-the double gold band trim is timeless and still looks as good now as it did 100 years ago. Four Noritake tea cups and saucers in Linton and two others in a similar pattern by a unknown manufacture (all rummage sale finds) are at the ready to hold the amber brew, and the flatware is Titanic by Reed and Barton (QVC), an exact reproduction of flatware found in Steerage on the ill-fated ship. I think the star pattern goes well with the snowflake design. Water goblets and the crystal centerpiece are Longchamp by Cris d’Arques (thrift store), and the bowl is flanked by two milk white hobnail vases by Fenton Art Glass (rummage sale). The grey/white/silver color scheme is cold, but adding the gold trimmed plates and the brown deer on the plates warm up the table setting nicely! 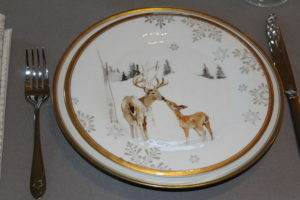 Jaclyn Smith Deer melamine plate. Wintertime Deer afternoon tea table setting.